In our May report we took a look at what makes a deal a Good deal, in the sense of what makes it sell well. 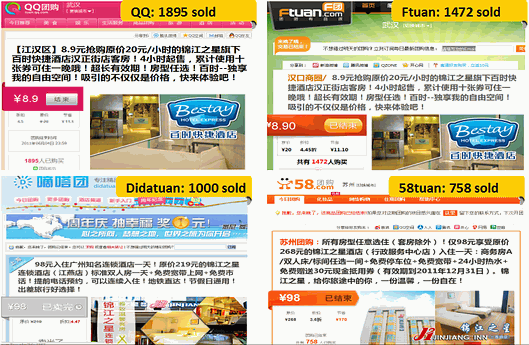 In our June report we provide again insights into the Chinese Daily Deal Market. Did you know for example that Lashou is doing far less good than last month? Besides the general observations though we look this time into the similar deals or what we call Re-targeting deals. Re-targeting deals are deals that have been offered succesfully before and are now copied by the competition that prefers to play it safe and bets that offering a similar or almost similar deal surely will be succesful as well. The fact that most venues at this stage of the game have been approached is another factor but the successfulness is the key motivator. We have analyzed many similar deals from the same vendor/venue. Merchant is well known, and is willing to explore daily deals. Merchant often has several stores. A site may have different offers from the same merchant at the same period. The original deals were successful. The deals often originate from small, local sites, then taken by the big players. The original deals are often cheap, the re-targeted deals are more expensive. Re-targeting deals can be deals in any category. To read the full report, including the general daily deal market status, yes, there really is a new number 1, please see hereunder.